I always loved rustic way of cooking . It’s all about simplicity but with lots of flavor !! 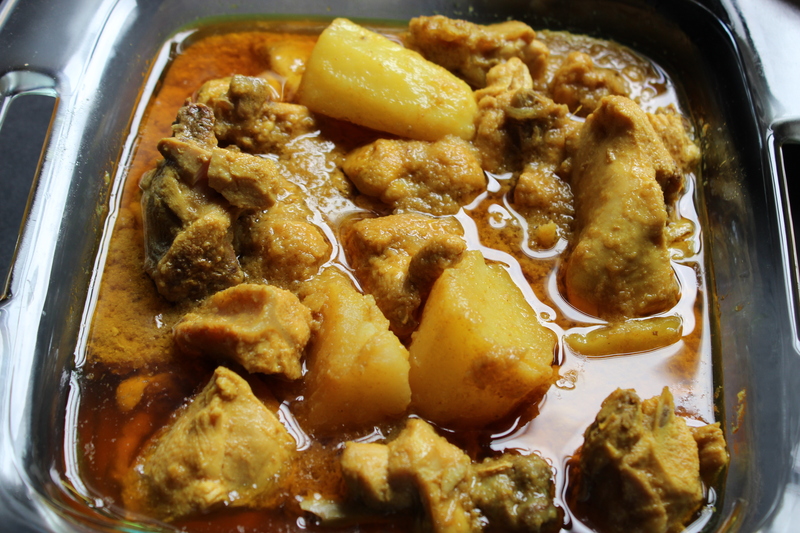 My today’s post is about Bangladeshi chicken curry , cooked in rustic way !! In this type of cooking there is no overmuchness or aggravation of spices , only few whole spices- that’s what makes the curry so aromatic and flavorful. The other condiments and spices are in paste form or pounded. 1. Take a pot in which you are going to cook the chicken . Take the chicken in that pot .Mix all the ingredients with chicken except cumin powder and potatoes . Add little water. 2. Cook the chicken on medium-low flame with lid on . The chicken will release water too . If you see the chicken is not done , but the gravy is drying out , you may add water little by little too . When the chicken is half done add the potatoes . You may add little water , if you wish . 3. When done , tuen on the stove . Sprinkle the dry roasted cumin powder and put the lid on . Keep it on warm stove until you serve . It will help to separate oil nicely giving it a tempting look . Enjoy with plain rice or even roti , pulao . This entry was posted in Glossary / Notes. Bookmark the permalink. I love traditional recipes too! This is the third time I am preparing this chicken. Believe me very simple but yummy recipe. Both my mother & sister tasted it & they loved it. Today I am at present preparing it for my husband.